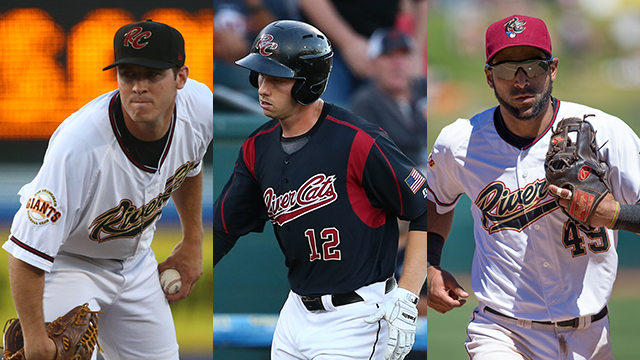 Minor League Baseball announced the San Francisco Giants organizational All-Stars for 2016 and included in the group are three River Cats - left-handed pitcher Ty Blach, outfielder Austin Slater, and infielder Ali Castillo. Blach put together one of the best years of his Minor League career, going 14-7 with a 3.43 ERA (sixth in the Pacific Coast League). He also made his Major League debut, going 1-0 with a 1.07 ERA over four outings (17.0 innings). His 2016 was highlighted by eight scoreless innings in a must-win game against the Giants' division rival Los Angeles Dodgers. Blach was also named the PCL's Left-handed Pitcher of the Year for 2016. After leading the Eastern League with a .317 average through 41 games for the Double-A Richmond Flying Squirrels, Slater found himself promoted to Sacramento and in an everyday role in the outfield. The 23-year-old struggled early, seeing his average dip to .227 after two months with the Triple-A squad, but turned things around in a big way in the final month of the season. Over the course of 30 August games, Slater hit .381 with nine home runs and 26 RBI. His performance earned him the PCL's August Player of the Month Award. Additionally, Slater impressed fans and the Giants alike with his versatility in the outfield, primarily playing the corners but taking over full-time in centerfield after Gorkys Hernandez was promoted to San Francisco. More impressively, prior to 2016, Slater had been almost exclusively a second baseman. With his 2016 performance, the young outfielder has forced his name into conversations regarding the Giants outfielders in 2017. Another former Flying Squirrel who made his presence felt in Sacramento was Castillo. Signed to a Minor League free agent deal last December, the infielder seemed poised to play a depth role in the organization, but put together one the best campaigns of his career, slashing .313/.351/.374 across both levels. Castillo played second, short, and third for the River Cats and showed off some flashy defense, making a number of exceptional plays around the diamond. The trio are joined by nine other players, including a number of highly-touted sluggers like outfielder Dylan Davis (Augusta, San Jose) and infielder Chris Shaw (San Jose, Richmond). Also named to the All-Star list is Giants No. 2 overall prospect, right-handed pitcher Tyler Beede. Beede, who led the Eastern League with a 2.81 ERA for the Flying Squirrels last season, is expected to start the season at Triple-A Sacramento come April. The full list of the Giants' 2016 organizational All-Stars can be found here. Fans can also vote for the player they think had the best 2016 for the organization, so vote now!